Will artificial intelligence sell more CT systems? March 14, 2018 -- It is already becoming clear that artificial intelligence (AI) will have a big part to play in the future of medical imaging. 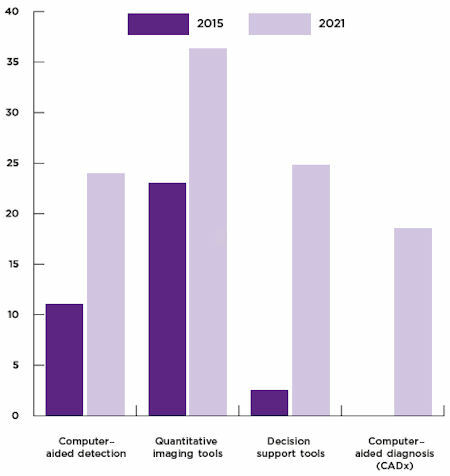 However, less clear is the impact of AI on the commercial market for medical imaging hardware. If we take the case of CT, a multibillion-euro hardware and services market, will AI drive greater demand for systems or less? Below, we look at a few of the trends shaping the direction of the CT market and discuss if, and how, AI will play a role. Support for the use of low-dose CT for lung screening has been gaining momentum, with health legislators in the U.S. and Western Europe calling for wide-reaching adoption, especially in high-risk populations. While there is little opportunity here to discuss the detailed arguments and evidence behind these recommendations, consensus certainly points toward greater use of low-dose CT for lung screening. In the case of Western Europe, recent guidelines recommend European Union-wide implementation of lung CT screening within the next 48 months. Lung screening is also one of the areas AI has made significant progress. AI-based software for computer-aided detection (CAD), quantitative imaging tools, and decision support for lung CT is already being used; examples include ClearRead CT (Riverain Technologies), QIDS (HealthMyne), Virtual Resident (RadLogics), and tools from Veye Chest (Aidence). While the capabilities and purpose of these AI-driven tools vary, they are all intended to increase the efficiency and quality of diagnosis based on lung CT scans. With growing availability and acceptance, AI will no doubt also support the growth in adoption of lung screening and with it, demand for CT systems. Market for medical imaging analysis software -- lung (revenues in millions). Source: Signify Research. Not all trends point toward a growth in CT use though. There is growing evidence toward structured use of incidental findings from CT scans, reducing the likelihood of patients needing multiple scans. A good recent example of this is the creation of the BARCS scale (Breast Assessment and Recommendation CT Score) from researchers at the Icahn School of Medicine in Mount Sinai, New York, U.S. Testing by experienced radiologists on chest CT scans showed that using the BARCS scale for incidental invasive cancers resulted in "good to excellent" results in comparison to standard mammography scans of the same patients. Stephen Holloway from Signify Research. The use of incidental findings from CT scans has not been well addressed to date, particularly as time-pressured radiologists may overlook more subtle incidentals while focusing on establishing the primary diagnosis. It's at this stage where AI can play a substantive role; if AI software can be used to detect subtle incidentals, later scans and radiologist resource could be spared, not to mention the patient benefits of earlier detection and treatment. In terms of CT system demand, AI will have a minor negative impact, but in comparison to the care outcome improvement, a negligible one. Wider use of a single-scan, multiple-diagnosis approach for CT also has some radiation dose benefits too. Dose monitoring and management have significantly improved with CT imaging over the last five years, especially given the improvements in tracking software and iterative reconstruction in the newest generation of CT solutions. If AI can further improve the "diagnostic richness" of information from each CT scan, the need for rescans or follow-up scans also could be reduced. While there has been less focus so far on use of AI in raw signal capture and interpretation, it also looks certain to play a role in the next generation of CT systems. The outlook for AI's influence on CT market demand, therefore, looks positive, though we should also not get ahead of ourselves, especially with the initial hype and regulatory uncertainty surrounding AI adoption. Putting this sharply in context, more obvious advances in CT technology over the last decade should also have a big impact on CT usage and adoption. The CT systems available today allow CT imaging more safely and effectively than ever, thanks in part to significant technological development and user education. This has borne steady, low single-digit revenue growth in the CT market, heavily dependent on system replacements. However, given that many users in Western Europe are still using systems up to 10 years old, the most likely boost and improvement to market demand and scan volume will come from a greater push to replace the aging installed base of European CT in short- to midterm, along with system demand generated by more widespread adoption of screening programs. AI will also certainly play a part in this growth, though its impact on the CT market will more keenly felt much later. 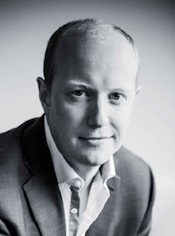 Steve Holloway is principal analyst at Signify Research, a U.K.-based independent supplier of market intelligence and consultancy to the global healthcare technology industry. Originally published in ECR Today on 2 March 2018.